We seek chapter proposals for a volume titled Star Wars and the History of Transmedia Storytelling, which aims to provide an account of the history of the franchise, its transmedia storytelling and world-building strategies, and the consumer practices that have engaged with, contributed to, and sometimes also challenged the development of the Star Wars franchise. We aim to have the collection in print by 2017, the year that marks the 40th anniversary of the first Star Wars film’s release. In those forty years, its narrative, its characters, and its fictional universe have gone far beyond the original film and have spread rapidly across multiple media—including television, books, games, comics, toys, fashion, and theme parks—to become the most lucrative franchise in the current media landscape, recently valued by Forbes at roughly $10 billion (Damodaran 2016). 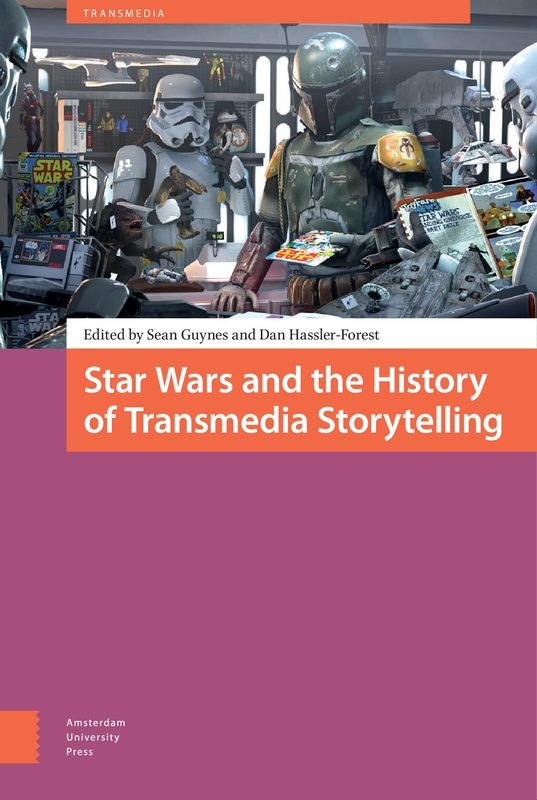 A key goal of this project is to highlight the role and influence of Star Wars in pushing the boundaries of transmedia storytelling by making world-building a cornerstone of media franchises since the late 1970s. The chapters in this collection will ultimately demonstrate that Star Wars laid the foundations for the forms of convergence culture that rule the media industries today. As a commercial entertainment property and meaningful platform for audience participation, Star Wars created lifelong fans (and consumers) by continuing to develop characters and plots beyond the original text and by spreading that storyworld across as many media platforms as possible. While there is much to be said about recent installments in the franchise, we discourage submissions that focus exclusively on Star Wars texts produced since the sale to Disney in 2012. Priority will be given to those submissions that demonstrate an ability to engage with the breadth of Star Wars media and fan activity, including (but not limited to) digital and analog games, novels, comics, televisions shows, tie-in merchandise, fanfic, and Star Wars events, places, and gatherings (conventions, exhibitions, shows, theme parks, performances, etc. ); or that bring new approaches from transmedia and franchise studies to old topics. Chapters solicited from invited authors, for example, already propose a broad range of topics, including transmedia worldbuilding in comics and novels surrounding the original trilogy; the limits and criteria that define the limits of “A Star Wars Story”; transmedia erasure and the Holiday Special; and the Star Wars collectible card game. If you have any questions, do not hesitate to contact the editors about the suitability of your topic for the collection. Submissions should include a provisional title, a 200-word abstract, and a 100-word biographical note. Abstract submissions are due by October 1, 2016. Drafts of 5,000 words will be due February 5, 2017, with a quick turnaround for editing and revisions so as to publish by Autumn 2017 before the 40th anniversary year ends.